Amazon one-hour delivery lives in Manhattan! 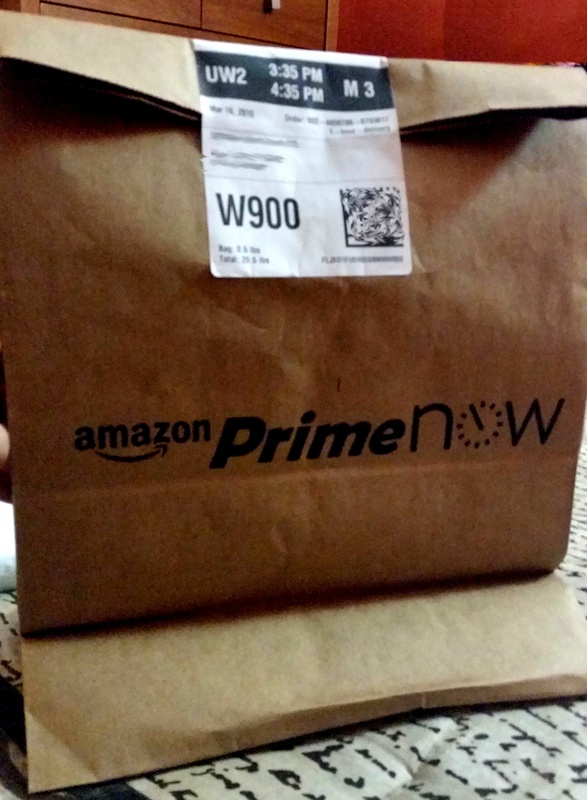 I learned that my neighborhood qualified for Amazon Prime Now a few months ago, and downloaded the app on my phone. But today I took it out for a test drive. I placed my order at 3:35pm, with guaranteed delivery by 4:35pm. At 4:11pm, the items arrived at my door. It is as fast as my local pizzeria! This entry was posted in Humor, Internet, review, Shopping and tagged Amazon, Amazon Prime Now, app, delivery charge, guaranteed delivery, Humor, Internet, it's a deal, Manhattan, minimum order, neighborhood, New York City, one hour or less, one-hour delivery, review, right this minute, shopping, test drive. Bookmark the permalink. That is so cool! I am jealous!